If you think the Patriot Act or Donald Trump’s rantings are something new, be advised of THE PALMER RAIDS which began in the United States, a hundred years ago. 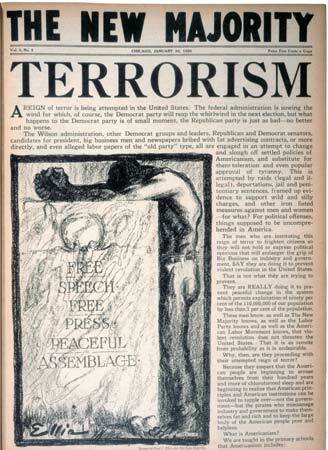 The Palmer Raids were a series of controversial raids by the U.S. Justice and Immigration Departments from 1919 to 1921 on suspected radical leftists in the United States. The raids are named for Alexander Mitchell Palmer, U.S. Attorney General under Woodrow Wilson. The crackdown on radical left-wing political groups had actually begun during WWI. After a series of bomb attacks of court buildings, police stations, churches and homes attributed to violent immigrant anarchist groups, the Department of Justice and its small Bureau of Investigation (BOI) (predecessor to the FBI) had begun to track their activities with the approval of President Wilson. In 1915, Wilson warned ofhyphenated Americans who have poured the poison of disloyalty into the very arteries of our national life. Such creatures of passion, disloyalty and anarchy must be crushed out. Handicapped by the secrecy of these groups and limited Federal law enforcement capabilities, the Bureau of Investigation significantly increased its workload on anarchist movements after 1917 when the Galleanists (followers of Luigi Galleani) and other radical groups commenced a new series of bomb attacks in several major American cities. The Russian Revolution of 1917 was also a background factor: many anarchists believed that the worker’s revolution there would quickly spread across Europe and the United States. On June 15, 1917, Congress passed the Espionage Act. The law set punishments for acts of interference in foreign policy and espionage. The act authorized stiff fines and prison terms of up to 20 years for anyone who obstructed the military draft or encouraged “disloyalty” against the U.S. government. After two anarchist radicals, Emma Goldman and Alexander Berkman, continued to advocate against conscription, Goldman’s offices at Mother Earth were thoroughly searched, and volumes of files and detailed subscription lists from Mother Earth, along with Berkman’s journal The Blast, were seized. As a Justice Department news release reported: A wagon load of anarchist records and propaganda material was seized, and included in the lot is what is believed to be a complete registry of anarchy’s friends in the United States. A splendidly kept card index was found, which the Federal agents believe will greatly simplify their task of identifying persons mentioned in the various record books and papers. The subscription lists of Mother Earth and The Blast, which contain 10,000 names, were also seized. In 1919, J. Edgar Hoover was put in charge of a new division of the Justice Department’s Bureau of Investigation, the General Intelligence Division. By October 1919, Hoover’s division had collected 150,000 names in a rapidly expanding index. Using this information, starting on November 7, 1919, BOI agents, together with local police, orchestrated a series of well-publicized raids against suspected radicals and foreigners, using the Espionage Act of 1917 and the Sedition Act of 1918. Palmer and his agents were accused of using torture and other controversial methods of obtaining intelligence and collecting evidence on radicals, including informers and wiretaps. Victor L. Berger was sentenced to twenty years in prison on a charge of sedition, although the Supreme Court of the United States later overturned that conviction. The radical anarchist Luigi Galleani and eight of his adherents were deported in June 1919, three weeks after the June 2 wave of bombings. Although authorities did not have enough evidence to arrest Galleani for the bombings, they could deport him because he was a resident alien who had overtly encouraged the violent overthrow of the government, was a known associate of Carlo Valdonoci and had authored an explicit how-to bomb making manual titled La Salute é in Voi (The Health is Within You), used by other Galleanists to construct some of their package bombs. In December 1919, Palmer’s agents gathered 249 people of Russian origin, including well-known radical leaders such as Emma Goldman and Alexander Berkman, and placed them on a ship bound for the Soviet Union (The Buford), called the Soviet Ark by the press). In January 1920, another 6,000 were arrested, mostly members of the industrial Workers of the World union. During one of the raids, more than 4,000 individuals were rounded up in a single night. All foreign aliens caught were deported, with no requirement that there be any evidence against them, under the provisions of the Anarchist Act. All in all, by January 1920, Palmer and Hoover had organized the largest mass arrests in U.S. history, rounding up at least 10,000 individuals. Louis F. Post, then Assistant Secretary of Labor, cancelled more than 2000 of these warrants as being illegal. Of the many thousands arrested, 550 people were actually deported. For most of 1919 and early 1920, much of the public sided with Palmer, but this soon changed. Palmer announced that an attempted Communist revolution was certain to take place in the U.S. on May 1, 1920 (May Day). No such revolution took place, leading to widespread derision of Palmer. Once seen as a likely presidential candidate, he lost the nomination of the Democratic Party to dark horse candidate James M, Cox. On September 16, 1920, a violent blast rocked Wall Street. The Wall Street Bombing killed 38 people and wounded over 400; it was never solved but was widely attributed to radical anarchists. As Winston Churchill opined: “America always does the right thing…after it’s tried everything else.”Of course, nowadays, Tea Partiers and the Radical rightwing reactionaries can assert their right to overthrow the government with seeming impunity. Threats of armed insurrection and “nullification” (one of the main issues that precipitated the Civil War) are, it seems, commonplace in the public “discourse.” Not sure if this is progress or not.